Halloween is just around the corner. And it’s time to start rummaging through your cupboard to find your child a costume that will put the “treat” into Trick or Treat. 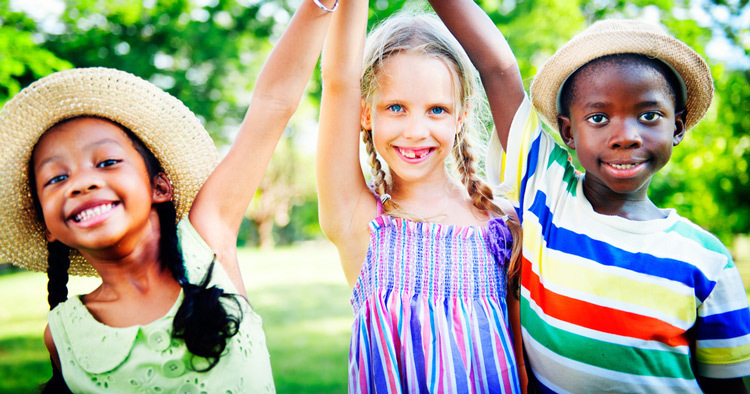 Here’s some inspiration to help you find the perfect kids’ Halloween costume. If your child’s a bit of an old soul, maybe it’s time you embrace it this Halloween. 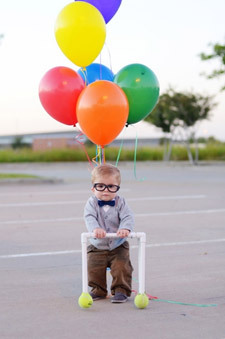 Dress your child up like Carl Fredricksen, the grumpy old man from Pixar’s animated hit, ‘Up’. The best part about this costume is how easy it is rustle up. Dress your little one in a “grandpa” jersey, a bowtie, and empty glass frames. Then, attach helium balloons, and a walker made from PVC piping and tennis balls. 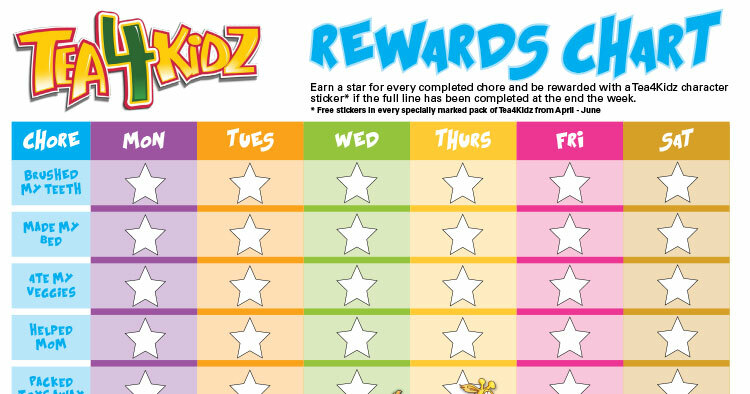 We guarantee your child’s outfit will be rewarded with all sorts of treats, which will have them grinning! What’s cuter than a lamb? 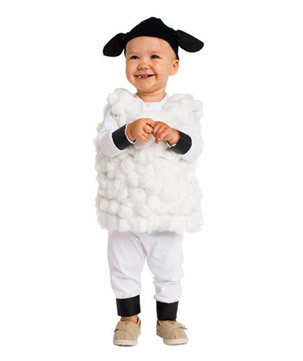 Your child dressed as one! With this easy DIY Halloween costume, you can’t go wrong. All you need is the following: lots and lots of cotton balls, one of your child’s old sweatshirts, black tape, a black beanie and black felt. Glue as many cotton balls to the torso of the sweatshirt as possible. Then, tape the wrists and ankles with thick, black tape. To make the hat simply cut ears from black felt and glue to the black beanie. If we are what we eat, let’s face it, most kids would be pizza. So, why not dress them up as one for Halloween? 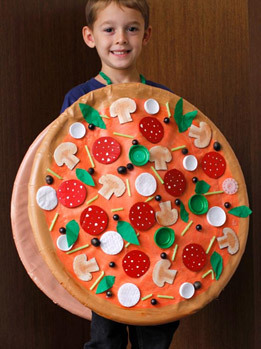 The best part is they’ll be able to decorate their costume with their favourite toppings. 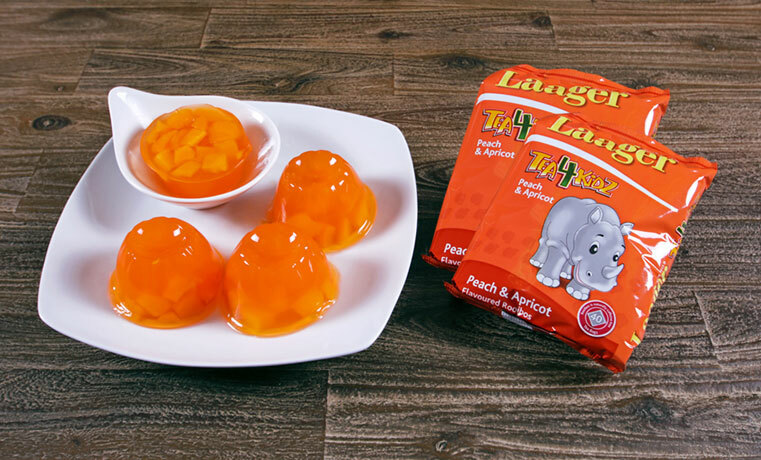 It’s incredibly easy to make. Take two large circles of cardboard or styrofoam, and paint them to mimic the base of a pizza. Then help your child cut out different toppings from another piece of cardboard. Paint them to look like the different toppings such as mushrooms, pepperoni or any other ingredients you’d like to add. Glue your toppings into place. Tie the top ends of pizza together with string or rope. Just be sure to leave enough space through which your child's head can fit. 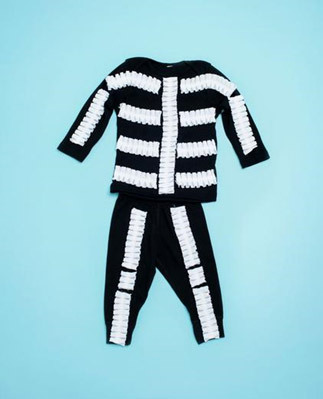 As one of the classic costume choices, it’s hard to go wrong dressing your little one up as a skeleton. This costume doesn’t require much to make. 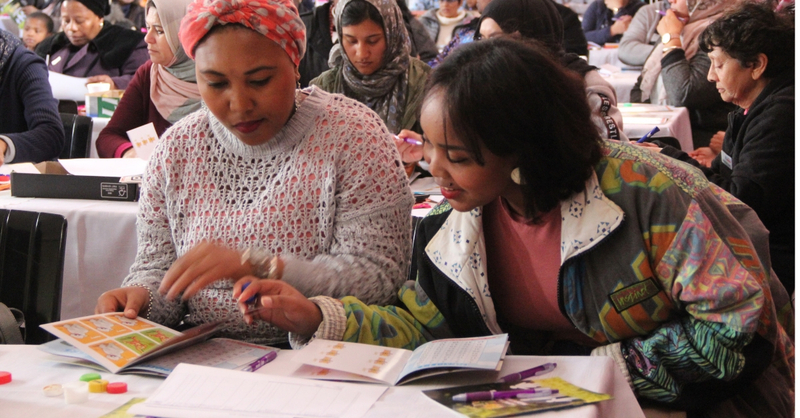 It’s the perfect option if you've left your planning to the last minute. All you’ll need is a pair of black pants and a shirt and some white pleated ribbon. Then, cut and glue ribbon to the shirt and pants. Be sure to stick the ribbons in a pattern that represents the spine, ribs, arm, and leg bones. Every kid is obsessed with Minions right now. They’re all the rage. So, why not dress your kid up as one? It’s easy. Start with overalls. Draw the “Gru” logo on them. Put a yellow hoodie on your little one, and put the overalls on after. Find goggles at your nearest party shop. 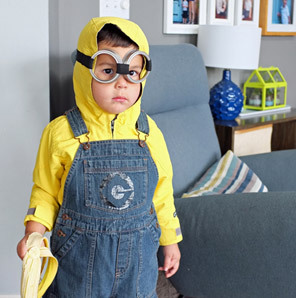 Complete the look with some yellow makeup, black gloves, black shoes and perhaps a banana to truly minion-fy your child.